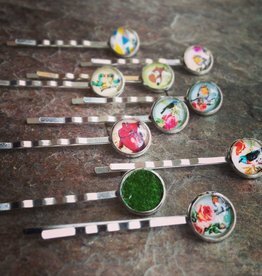 With fun images behind bubbles of glass set into silver plated studs these are fun colorful bobby pins to brighten up your outfit. The cabichons are about half an inch in diameter, just big enough to see the fun images. Canadian clothing and accessories with an eco friendly edge.